A Russian adventurer clothed in a specially designed wingsuit has jumped off the highest freestanding volcanic mountain in the world – Kilimanjaro - spending some 60 seconds in a free fall, covering about three kilometers. The 50-year-old daredevil Valery Rozov has done something no one has previously attempted before. In a world-first, he conquered the fear of plunging 5,460 meters (23,687 feet) into oblivion from the Uhuru point of Mount Kilimanjaro, Africa’s tallest peak in Tanzania. BASE (Building-Antenna-Span-Earth) jumping is basically jumping off structures, while wearing a parachute or sometimes what amounts to a squirrel suit or wingsuit. People flock from all over the world to leap off their favorite cliffs, mountains, bridges or buildings. He also told Red Bull what went into setting up the crazy stunt. "The main problem in searching for the ideal jumping spot was that the wall was not vertical,” he said. "We spent a whole day looking for it. After missing the opportunity to jump, we spent the night in the crater of Kilimanjaro at 5,750 meters. The next day, it was too windy and cloudy, so we managed to jump only on the third day of our stay on the summit." The sportsman set another record in 2013, when he took a winged flight off the north face of Mount Everest – the world’s tallest peak. 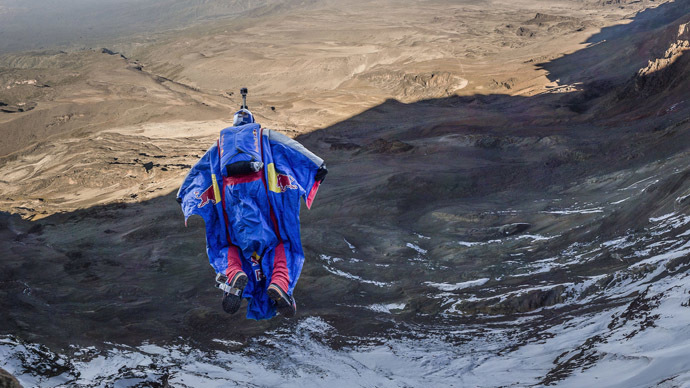 The record was for the highest-ever BASE jump – 7,220 meters (23,687 feet).